Day 11. Most of today was spent on the bus travelling from San Cristobal to Palenque. Unfortunately there was a traffic jam on the way out of San Cristobal which delayed us by a couple of hours, so all told, we spent seven hours in transit. 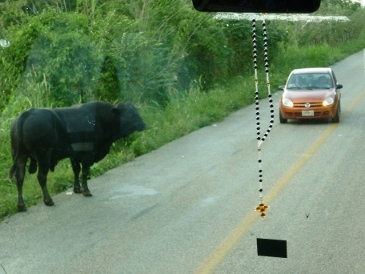 En route, apart from a few suicidal dogs and chickens (which don’t respond to beeping), and the odd unplanned stop so the drivers could buy fruit or corn, the most interesting event was the oversized bull that decided to share the highway with us. The rosary beads that hang from the windscreen of every bus are there for a reason! Palenque is a lot warmer and a lot more “Mexican” than San Cristobal. Tomorrow, off to another pile of bricks in the middle of the jungle. Charlton MA O’Dees are living vicariously through your adventures! 0 degrees F here last night so send some warm weather wishes this way. Hi Tony … hope you had a Happy Birthday! We did send you a card from somewhere in the mountains in Mexico, but the chances of it arriving are probably slim. We were thinking of you on the day! Hope you continue to enjoy our adventures. Maybe you can do another crazy long weekend break and join us in one of our destinations. Annie & Safe.